Anyone who knows ICT artistic director caryn desai knows she’s truly passionate about two things; the first and most important being theatre, followed by health. Despite her many meetings and demanding schedule, caryn always makes time for fitness throughout her week. One way she does this is by doing a small, three minute workout once a day with her staff. Spoiler alert: she did. And does. And more! Over time I noticed I was taking less breaks during our wall sits, and in just over a month’s time, I was shocked that I could already hold myself up for three full minutes. It was always challenging, but at some point I didn’t have to take breaks anymore. Once I eventually became comfortable with the wall sit duration, we decided to add 20 hip-thrusters to the last minute of the wall-sit. And to no surprise, my thighs were aching again. Again I started to wonder, “are we doing to do THIS every day?” You better believe it! Our three minute wall-sits were now accompanied by some hip work every afternoon. And guess what else? That got easier too. 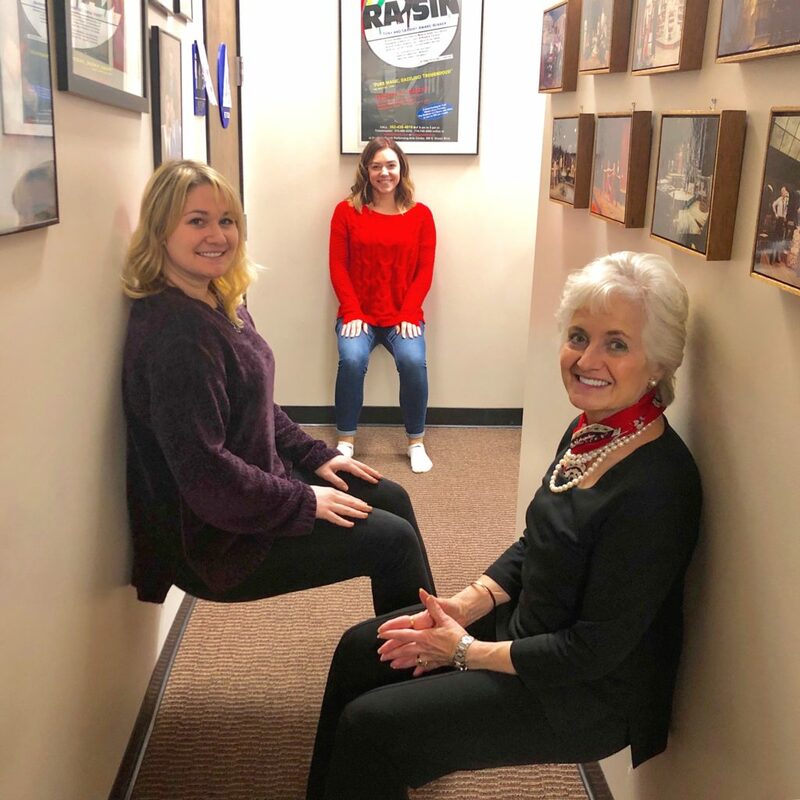 Originally just called “wall sits,” this routine has now grown into a mini circuit that caryn does with us every afternoon. We’ve now also added arm circles, 100 in each direction during the first 2 minutes of the sit. This new addition is still a challenge for us, and I even occasionally break a little sweat by the end. But after looking back at how far we’ve come, I’ve learned to find comfort in discomfort, because that means we’re growing. One thing caryn always says to us when we try to get out of the exercises is “you’re only cheating yourself.” And as cliché as it may be, it’s full of truth and wisdom and applies to any aspect of our growth. I’ve worked for caryn for a year and a half now, and I can absolutely say that my body is stronger now than when I started. Taking that consistent three minutes out of our day has made me a stronger person, physically and mentally. I used to loathe when I’d hear caryn start the timer on the microwave and ask “anybody want to do wall-sits?” in her usual, chipper demeanor. But now I have seen enough improvement to know that those three minutes do make a difference. And when I cheat those three minutes, I’m only cheating my own improvement. So instead of thinking about what I have to lose, I’ve instead started to think about all I can gain.